This Dragon was unlike any that I’d seen before: for it was “less Eastern more Western”; but with several “woodland traits”. This Dragon’s wings reminded me, of a “forest curtain”. This Dragon’s scales reminded me, of “creeping vines”. This Dragon’s body reminded me, of “oaken wood”. This Dragon’s head reminded me, of a Western Dragon; but with a twist, for this Dragon’s horns, seemed reminiscent of a Forest Stag! Thus did I encounter, this Dragon and his “fairy glamour”. What was the Dragon doing? It seemed to me that this Dragon, concerned himself with “Forest Tasks”. Wrapped around this Oaken Tree, a “busy bee” of Springtime “change”. The gold of the autumn leaf, the green of the sapling bud. The gold of the autumn tree, the green of the pasture new. The wind of the autumn breeze, the “fairy wand” in emerging Spring. What was the Dragon growing? It seemed to me that this Dragon, concerned himself with the “Tree of Life”. Growing from this Oaken Tree, a “worker bee” of “Forest Furnace”. The painting of the leaves so new; in shades of green – with twists of Elven. The laying of the grass so soft; in blades of green – with hints of Sun. The spreading of the seed so fine; in grains of brown – with bud in Sight. 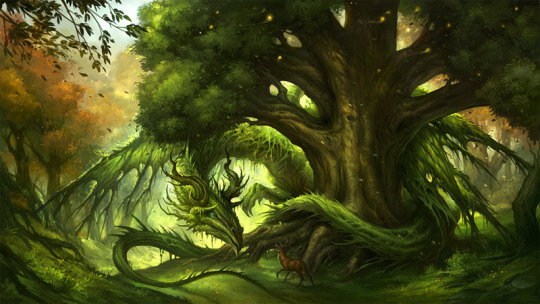 For in this Woodland Home – I found this Dragon and his Seed: Wise of Eve and Green of Adam. This entry was posted in Fantasy Dragon Art and tagged dragon, dragon hoard, fairy glamour, fantasy, mythical creatures, spring, western dragon. Bookmark the permalink.